Bacteria is usually thought of as something to avoid. Many people use things like antibacterial hand gel or surface wipes to eliminate bacteria because a few serious illnesses are caused by bacteria—including things like salmonella, e-coli, strep throat, and meningitis. It’s no wonder some of us are bacteria-phobic. However, not all bacteria are bad. In fact, some bacteria are downright healthy and vital for your wellbeing. And some of these bacteria live inside you. This is the concept behind Probiotic America and Perfect Bitoics®. The human body is home to about 100 trillion bacterial cells. Exposure to antibiotics, OTC drugs like painkillers and laxatives, chlorinated drinking water, pollutants, trans fats, excess sugar consumption, and too much physical and emotional stress can all reduce the presence of good bacteria in your body – sometimes called microflora. To reestablish bacterial order, many people turn to foods that contain good bacteria. Humankind has been using foods that are naturally high in good bacteria since early Roman times. Fermented vegetables and dairy foods are part of most culture’s cuisine for a good reason – theyare loaded with healthy bacteria. Kefir, natural yogurt, sauerkraut, miso, kimchi, tempeh, and pickles are all good sources of naturally occurring good bacteria. However, some of these foods are unusual, not readily available, or are an acquired taste. Kefir, for example, tastes like sharp, slightly gone-off, fizzy yogurt! Other people turn to supplements called probiotics. Probiotics (meaning to promote life) contain live bacteria, which are said to repopulate your microflora. Probiotics are a hot topic right now and there are lots of probiotic supplements available including Perfect Biotics. 1. What is Perfect Biotics? 2. How does Perfect Biotics Work? 3. What are the Benefits of Perfect Biotics? 4. How do you know if Perfect Biotics Contains live Bacteria? 1. What is Perfect Biotics®? 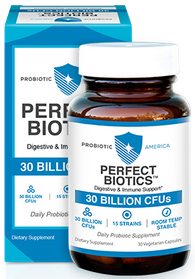 Perfect Biotics® is a supplement made by Probiotic America. The company is headed up by Dr. Cary Nelson, a board-certified family practitioner. Like three-quarters of Americans, Dr. Nelson suffered from digestive issues that he successfully treated with probiotics. This inspired him to create Perfect Biotics®. · Lactobacillus Salivarius – claimed to protect against cavities and gingivitis. · Lactobacillus Casei – may help inhibit the inflammatory response. · Lactobacillus Plantarum – possibly helps heal injuries. · Bifidobacterium Infantis – may contribute to improving your immune system. · Bifidobacterium Bifidum – can help prevent the overgrowth of candida (yeast). 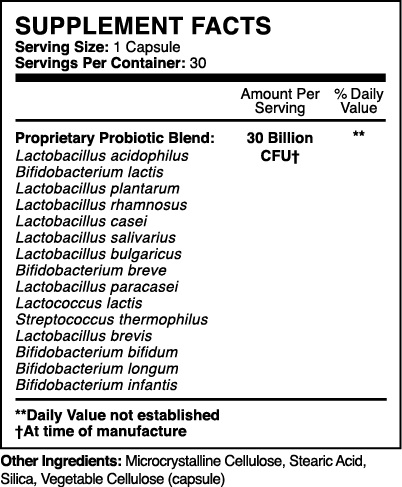 · Lactococcus Lactis – helps metabolize (break down) carbohydrates. · Lactobacillus Acidophilus – may contribute to reducing blood pressure and cholesterol levels. · Streptococcus Thermophilus – possibly helps fight respiratory infections. · Lactobacillus Paracasei – may help relieve symptoms associated with atopic dermatitis (eczema). · Bifidobacterium Breve – can reduce gas and other bowel, stomach, and intestine irritation. · Bifidobacterium Lactis – can improve digestive comfort. · Lactobacillus Brevis – may help prevent kidney stones. You can read more about the benefits and efficacy of probiotics in this comprehensive article by the Medical Journal of Australia. Each capsule of Perfect Biotics® contains 30 million Colony Forming Units, CFUs for short. This means that Perfect Biotics is one of the more potent probiotic supplements on the market as most average 10-20 million CFUs. Bacteria are easily damaged by digestive enzymes and bile acid. This means that some probiotic supplements fail to deliver any live bacteria to where it is needed–your gut. However, Perfect Biotics’ proprietary blend of good bacteria is specially selected to be both bile and gastric acid-resistant. The capsules used in the delivery of Perfect Biotics® are also designed to ensure that their good bacteria payload survives the digestive process and arrives in the gut, where they are needed, unscathed. The product itself is packaged in dark green glass bottles to protect the contents from potentially harmful sunlight. The bacteria are flash frozen which preserves them without killing them. It also gives Perfect Biotics® a shelf life of 24 months after manufacture and does not require refrigeration. The recommended dosage is one capsule of Perfect Biotics®, once a day, preferably with your first meal. 2. How does Perfect Biotics® Work? Your body is home to a lot of bacteria. Ideally the number of good bacteria should far outweigh the bad—a ratio of around 80-20. However, overuse of antibiotics, antibacterial cleansers and hand sanitizers, an unhealthy diet, and too much stress can tip the balance the other way. Lack of good bacteria, and therefore, too many bad bacteria, can disrupt your digestive system which is why the lack of good bacteria often manifests itself in the form of persistent stomach upsets. A bacterial imbalance is called dysbiosis and can mean that your body is unable to digest food properly, absorb nutrients from the food you eat and produce the substances it needs to keep you healthy. Disrupted digestion can have a knock-on effect on your entire body. You are what you eat and, even more so, you are what you can digest and absorb. From your skin to your stomach to your immune system to your brain, all of your body systems are dependent on proper nutrition. A dysfunctional digestive system can affect every aspect of your health. Lack of certain good bacteria may even be the cause of many common and often ignored medical conditions including lactose and gluten intolerance. 3. What are the Benefits of Perfect Biotics®? With its blend of probiotics, Perfect Biotics® promises numerous health benefits. While a large body of research does support the use of probiotics, that research is somewhat sketchy, and scientists are unable to agree on how probiotics actually work. It’s not clear that taking pro-biotic supplements actually make a meaningful or lasting change in your body. It’s also unclear—out of the trillion bacteria your body holds, which pro-biotics you may be short on. There is no way to test and no way to know if you’re taking the right combination for your body. · Boosting your immune system by producing antibodies against certain viruses. · Producing substances that prevent infection. · Preventing harmful bacteria from attaching to the gut wall and growing there. · Sending signals to your cells to strengthen the mucus in your intestine which acts as a barrier against infection. · Inhibiting or destroying toxins released by certain “bad” bacteria that can make you sick. · Producing B vitamins necessary for metabolizing the food you eat, warding off anemia caused by deficiencies in B-6 and B-12, and maintaining healthy skin and a healthy nervous system. It is, however, important to understand that while some studies support the use and benefits of probiotics, others refute their benefits and label them as useless for healthy adults. Of course, “healthy” people may not need probiotics. Cost Saving Tip: If you’re looking for a purely natural way to boost your probiotic levels, you need only increase your intake of fiber. The positive bacteria in your gut feed on fiber and need it to reproduce. Because they are a natural substance, probiotic supplements are deemed to be safe, and any side effects are very mild and short lived. Some users report a slight worsening of digestive problems. If you’d like to know about probiotics in general and Perfect Biotics specifically, here is a video presented by Dr. Cary Nelson, head honcho of Probiotic America. 4. How do you know if Perfect Biotics® Contains live Bacteria? After independent investigation, many probiotic supplements have been found to contain no live bacteria. This means they were a useless waste of money. Pour 4 oz. of cold milk into a glass and then add two probiotic capsules to the milk. Leave the milk at room temperature for 48 hours. After 48 hours, check the milk. If it has thickened into a yogurt-like consistency, your probiotic is working normally. The use of probiotics is controversial with some experts convinced of their health benefits while others label them as a waste of money. We believe that, like multi-vitamins, fish oils, and other general nutritional supplements, probiotics can be beneficial and can act as a “safety blanket” to help keep you healthy. We prefer to opt out of supplements in general, and aim for a naturally healthy diet with achieved through real food. However, if you’re considering a probiotic supplement, Perfect Biotics is a good choice. With its comprehensive blend of good bacteria, Perfect Biotics® covers a lot of bases and its 30 million CFU content means it’s a high potency product. Probiotic America’s manufacturing process is designed to preserve the good bacteria and ensure you get as many of those 30 million Perfect Biotics® bacteria as possible to produce the best possible results from this product. Will taking Perfect Biotics® eliminate unpleasant conditions like food intolerances, stomach upsets, gas, bloating, dull skin, or mental fogginess? Simply because your results will depend on your personal “bacterial balance” and the actual cause of any problems you might be experiencing. For some people, Perfect Biotics® will be a miracle in capsule form, and they’ll feel happier, healthier, and more energetic as a result of using this product. Others may notice very little in the way of benefits. All this means is that some people need probiotics more than others. Remember, one study stated that probiotics are useless for healthy adults, so it makes sense that if you need them they’ll work, and if you don’t need them, they won’t. Also, it’s important to understand that some medical problems have multiple causes; bloating and other digestive issues could be the result of something other than too few good bacteria. The best and probably only way to see if Perfect Biotics® is right for you is to take them for a month and see. Because they are safe, you certainly won’t do yourself any harm, but you could do yourself a lot of good. Perfect Biotics®, on the whole, has been very well received and reviewed. Many users have reported being very happy with their purchases. A few customers say that it did nothing for them but, as discussed above, that may simply be because their symptoms were caused by something other than low levels of probiotics. Some users complained that they didn’t lose weight when using Perfect Biotics. While Perfect Biotics® may help weight loss by restoring gut health, it is not a weight loss product, so this is hardly surprising.